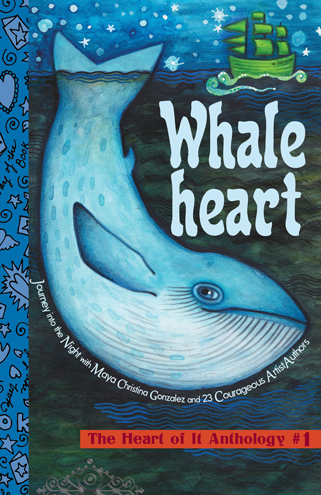 Whaleheart is the first anthology of new writing to emerge from The Heart of It: Creating Children’s Books that Matter, a course run by award-winning author and artist Maya Christina Gonzalez (I Know the River Loves Me / Yo sé que el río me ama), who has topped and tailed the collection in such a way as to gather all the stories into the fold of one embracing narrative. Twenty-three new and emerging writers/artists are showcased, each presenting a double-page spread. They offer a glimpse at a diverse range of cultures and artistic styles. In Maya’s beautifully illustrated embracing narrative, a woman begins a night-time journey in her ‘old friend the river’, where she waits for the ‘storyfish’ to rise. As she gathers ‘the poemas and myths, the tales and cuentos’, she hears a voice telling her to follow the flow of the river: and so she arrives at the sea, where she meets Whaleheart, who encourages her to use the stories she knows to weave a tale that will help her find the ‘story ship’, where she will encounter new storytellers and new stories. The woman climbs aboard and the storytellers’ stories continue… I love the illustration here: it can be no coincidence that exactly 23 discernibly different people are depicted looking over the side of the boat as the woman climbs aboard. How wonderful to have this group portrait of all the contributors to the book! Some of the spreads present a complete nugget in prose or verse; others seem to dip into a thought and out again. 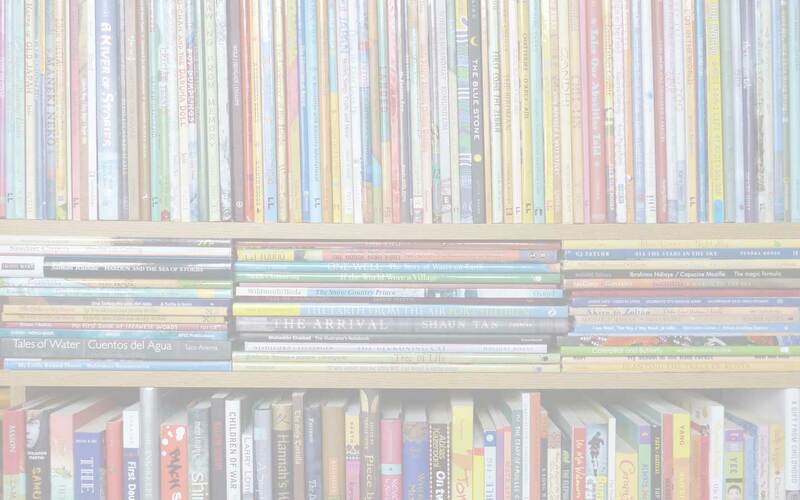 All together they offer an inspiring collection with scope for young readers to take hold of the words and images and to engage their own imaginations and tell their own stories. Whaleheart points explicitly to the connectedness of stories thereby connecting us. In fact, the way this anthology is designed sends out a joyous mantra to the power of stories to evoke that connection, even though each individual story is unique and different. The collection is aptly named – it does indeed have a big heart. Find out about all the contributors to Whaleheart by clicking on the Featured ArtistAuthor Bios tab here. 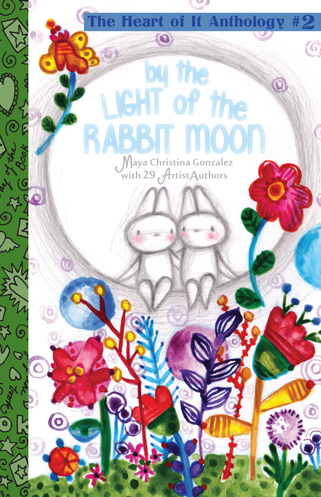 By the Light of the Rabbit Moon: The Heart of It Anthology #2, Cynthia A Weber, Indelisa Carrillo, Innosanto Nagara, Janine Macbeth, Jim Cartwright, Jorge Tevalan, Maya Christina Gonzales, MWD book reviews, Reflection Press, School of the Free Mind, Silvia Garcia, Summer Edward, The Heart of It Anthology, Whaleheart: The Heart of It Anthology #1. Bookmark.